As soon as you arrive on holiday at Craigwell Cottage, Edinburgh you’ll see views towards Salisbury Crags from the living room window. 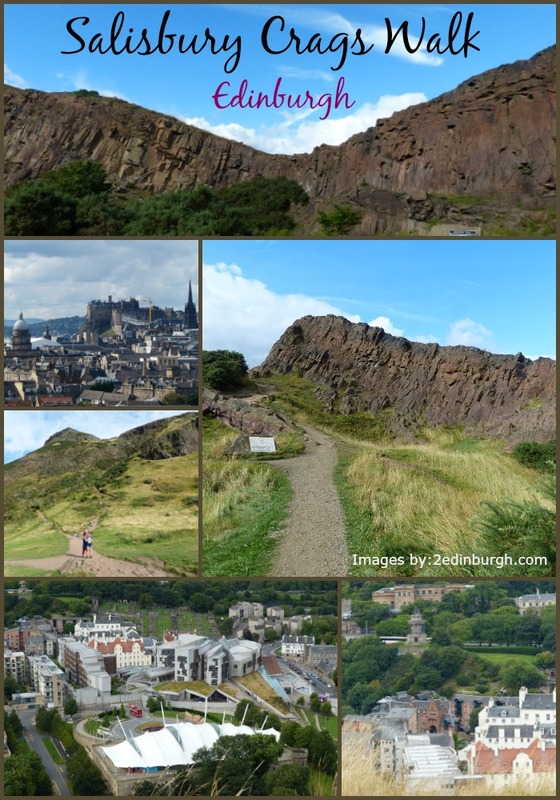 So, one sunny day in September, we set off on a Salisbury Crags Walk from the cottage in to Holyrood Park to take some photographs so that you might include this walk in your plans for your stay in the city. We love to take this walk at any time of year, but always advise that as the footpath is rocky, you should definitely make sure to wear suitable footwear – sturdy trainers or walking shoes at the very least, hiking boots probably best. 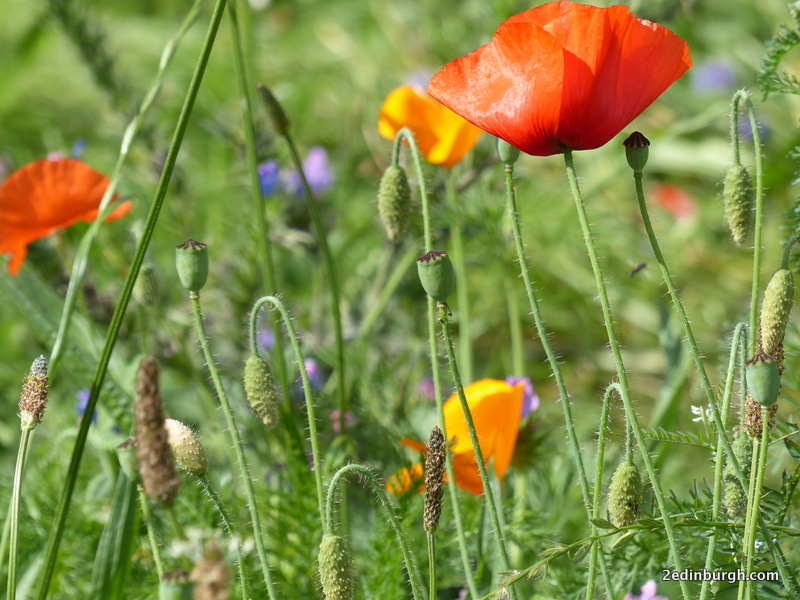 Colourful poppies were still blooming in September. In to Holyrood Park and across the road, taking a slight left to the bottom of the footpath at the base of Salisbury Crags. A few minutes walking and we were high enough to see views like the one below. To the top left of the picture you can see the Dugald Stewart Monument, the upside-down telescope of the Nelson Monument and the unfinished National Monument. 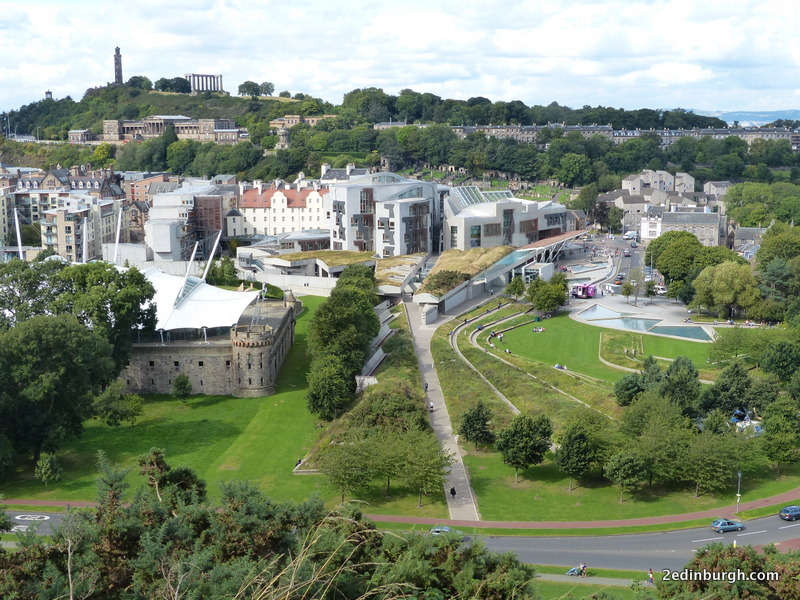 To the centre is the Scottish Parliament building, with the red-roofed older building being the 300-year old Queensberry House. The castellated building with the tent-like roof at the bottom is Dynamic Earth where you can find out about the geology of Scotland and how the lands were formed. 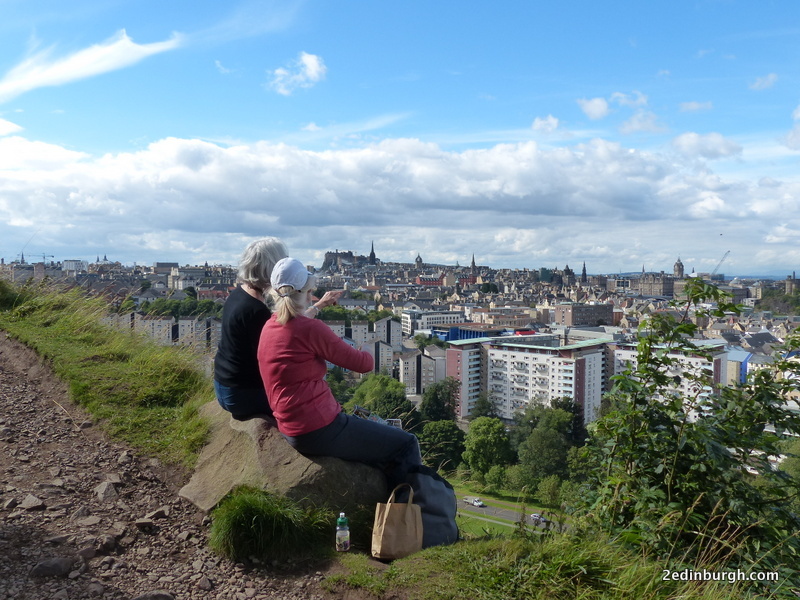 Some of our fellow walkers had taken a picnic and stopped on a convenient rock to the side of the rocky path to take in the views and see how many of the buildings they could identify. 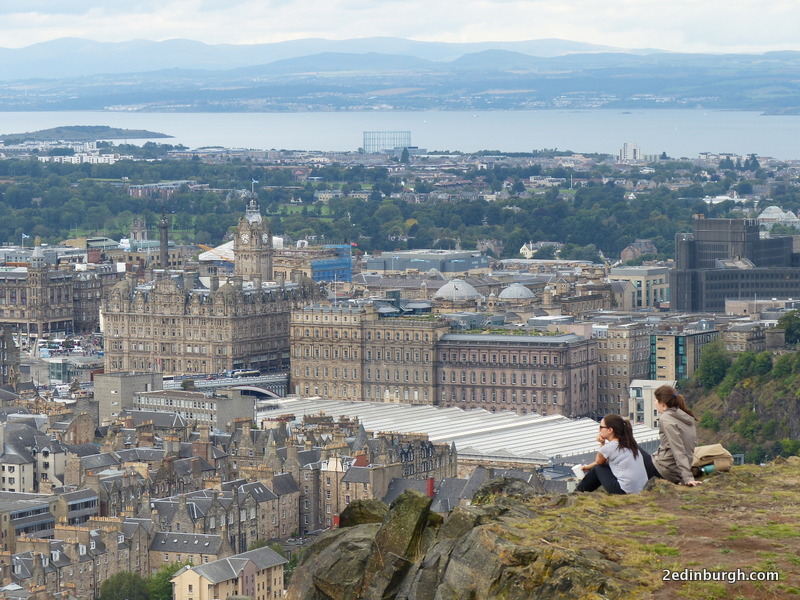 You’ll see Edinburgh Castle and The Hub (Edinburgh Festival’s Centre) just to the right of their heads, with the crown-like spire of St Giles Cathedral just to the centre of the horizon. The rocky path we were walking on is known as the Radical Road and was constructed by unemployed weavers in the 1820s at the suggestion of Sir Walter Scott. We stopped for a little while to take in the views, take some video and enjoy the panoramas from this part of the path too. In the shot below you can just see the Palace of Holyroodhouse to the extreme right of the picture. 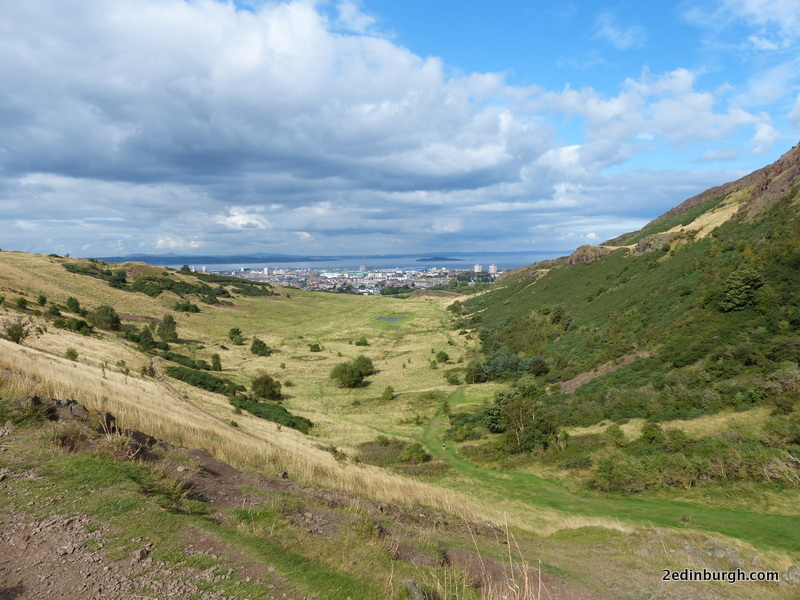 As the path levels out after our steep climb, we could see views towards the Pentland Hills and Craigmillar Palace to the south, and we went in search of a piece of geological history. In front of the crags is a small plaque commemorating the “father of modern geology”, James Hutton, who in 1788 found a section of rock under the sill of the crags, and concluded that hot molten rock had pushed the rocks up from below. I’ve included a link in the notes below to a blog which explains this from a geological perspective. At the end of the Radical Road section of our walk we had some choices of where to go next. 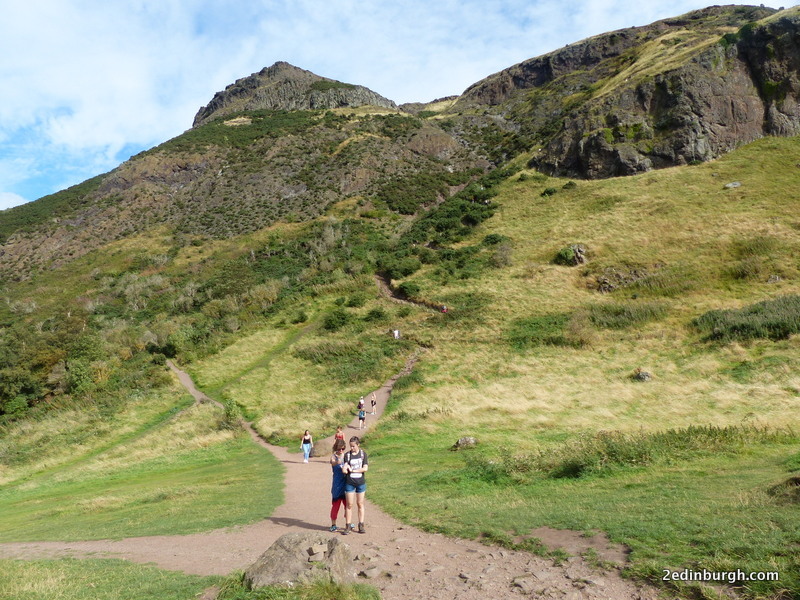 You can descend and join the roadway which you can then follow round the back of Arthur’s Seat to Dunsapie Loch where you’ll find the easiest paths to ascend Arthur’s Seat. 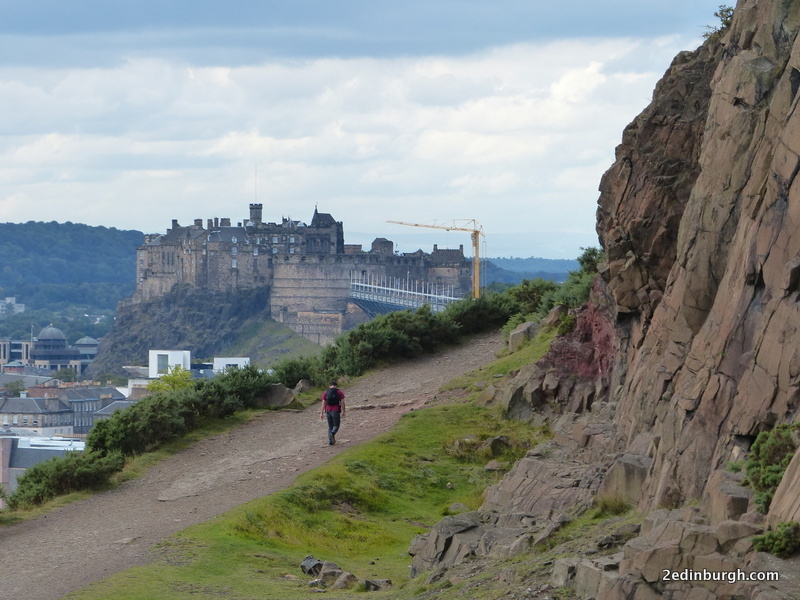 You can choose to go ahead and follow the winding, steep pathways up to Nether Hill and then on to Arthur’s Seat (the peak to the left of the photo below), or you can turn to the left and head upwards on to the top of Salisbury Crags for more views, which is the route we chose. It’s a bit of a scramble at first and if it’s windy, you are advised to keep well back from the edge of the crags as it’s very high at parts and dangerous to go too close to the edge. 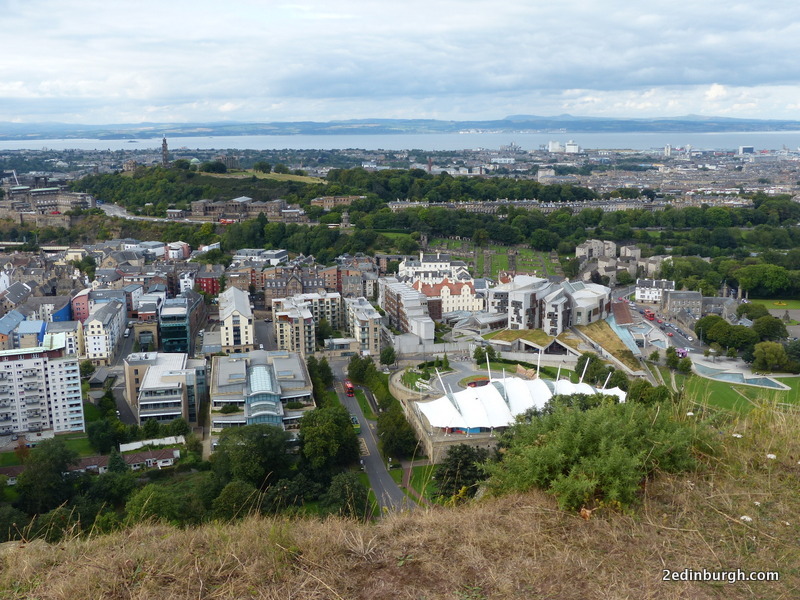 Before we climbed on to the top of Salisbury Crags we took a look at the view over Hunter’s Bog and towards Inchkeith in the river Forth, and over to Fife in the distance where we could spot Kirkcaldy, familiar from our walks on the Fife Coastal Path. From the top of Salisbury Crags we had good views towards Edinburgh Castle where they were busy dismantling the stands erected for the Royal Edinburgh Military Tattoo which takes place in August each year. Some more of our fellow walkers were enjoying a flask of tea after their hike up to look at the views. In this picture you will notice the building with the clock tower which is The Balmoral Hotel, with buses on North Bridge passing between the hotel and the Waverley Gate building (the former Edinburgh General Post office) The two grey domed roofs behind this are General Register House, and the glass roofs in the centre cover Waverley Station, Edinburgh’s main rail terminus. Zooming in (with my Panasonic Lumix DMC-FZ200 in case you wondered), we can see the living room window and above the roofs above the townhouses in the centre of this shot, the garden of Nether Craigwell where someone has their washing out! At the top of the garden you can see the Burns Monument which is situated on Regent Road. 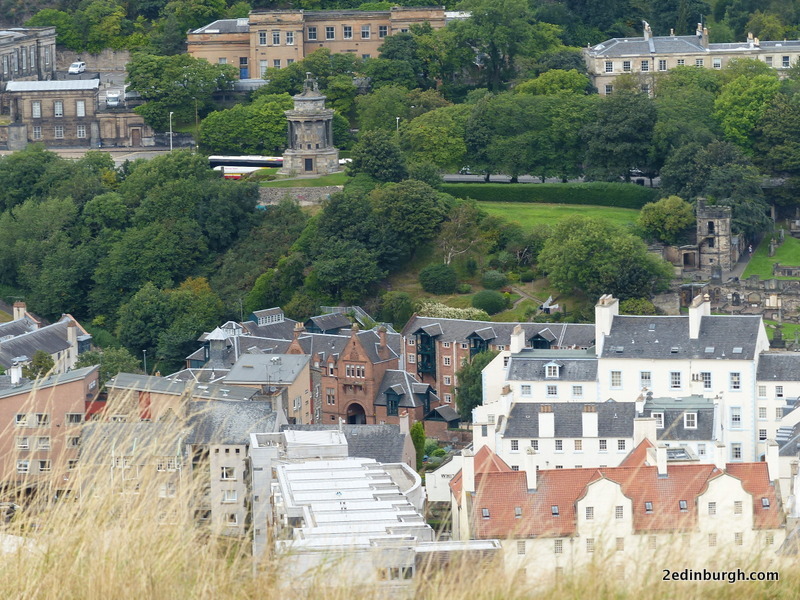 To the right of this image is the edge of New Calton Cemetery with the Watch House just visible. 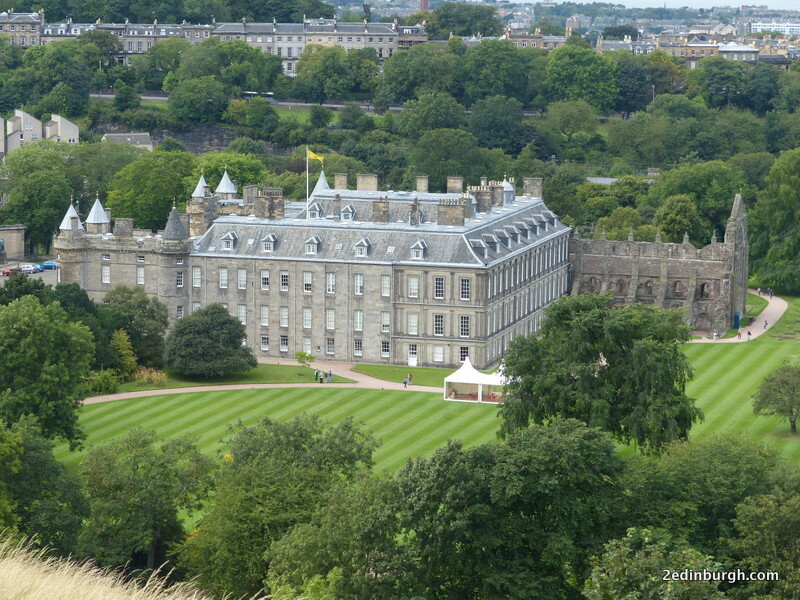 The last part of our walk gives us some fine views over the Palace of Holyroodhouse and Holyrood Abbey. There are excellent exhibitions held in the Queen’s Gallery, showing artworks from the Royal Collection, and a visit to the Palace is a must for enthusiasts following the trail of Mary Queen of Scots as well as fans of Diana Gabaldon’s Outlander Series. 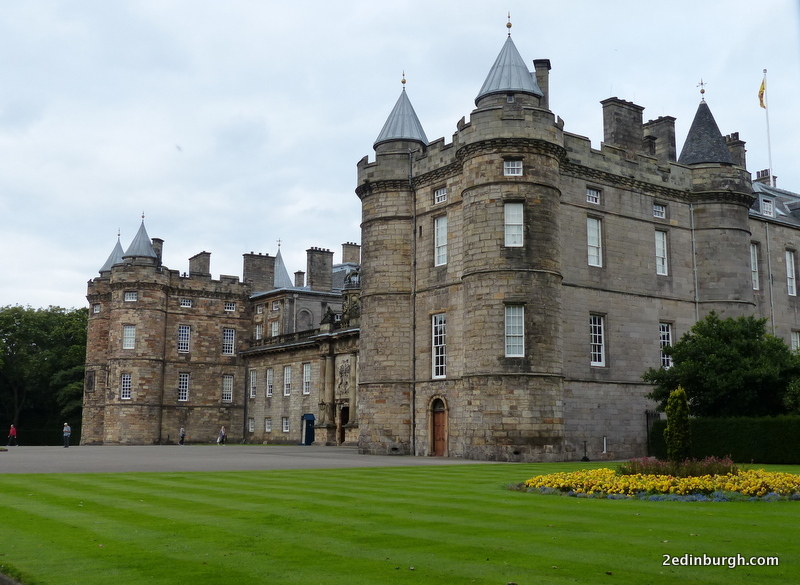 As we pass the south gates of the Palace of Holyroodhouse I take a peek in with my camera. 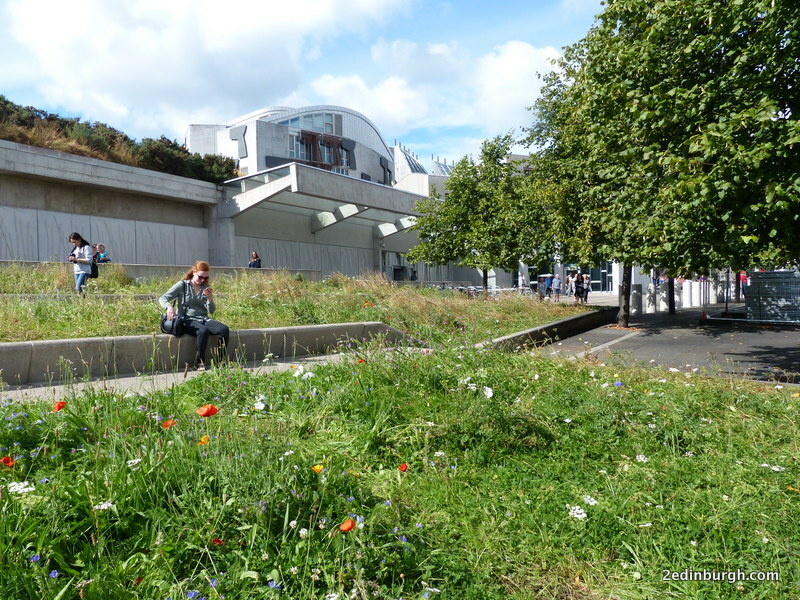 The gardens are looking in excellent condition – must be something to do with rainy days in Scotland! 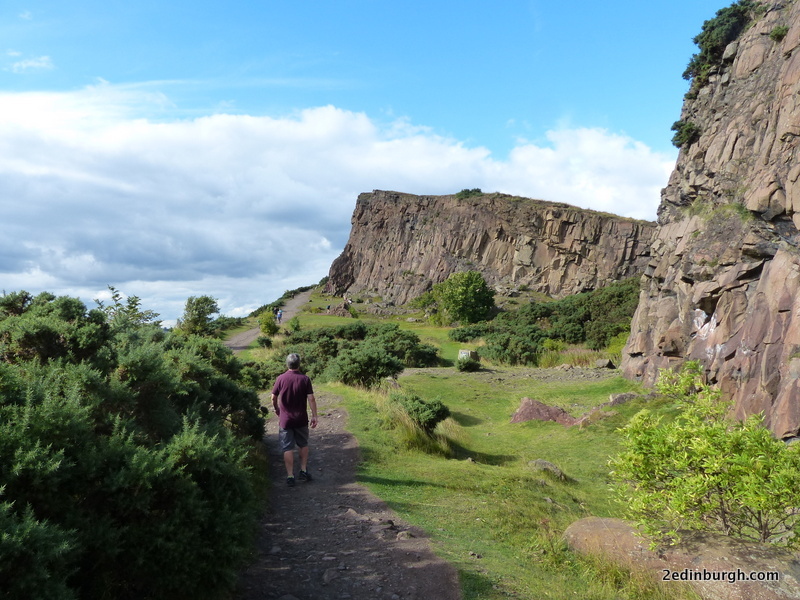 We hope you’ve enjoyed taking this Salisbury Crags walk with us from Craigwell Cottage. If you’d like to stay with us, simply select your dates using the “Book Now” box for a quote, and we look forward to welcoming you to Edinburgh and showing you the view towards Salisbury Crags from our window! 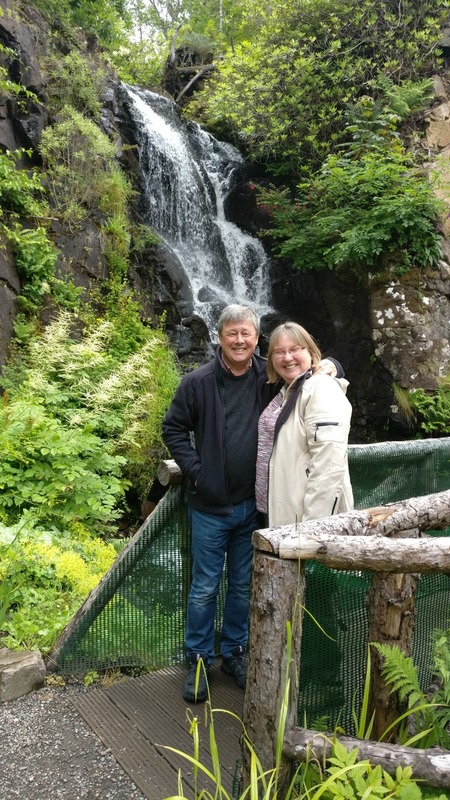 Find out more about the places mentioned in this article, and things to do while you’re staying at Craigwell Cottage. New Calton Burial Ground established in 1817.